The National Institute for Reproductive Health is proud to announce our state and local partnerships for 2019! In 2019 we’re working with partners in 22 states, including 14 cities and counties to advance proactive reproductive health, rights, and justice policies. In this time of continued attacks on reproductive freedom and the potential for the Supreme Court to further undermine abortion rights, it is more important than ever for state advocates and lawmakers to enact a proactive vision for reproductive freedom and to build a vibrant movement in support of reproductive health, rights, and justice. In 2019, NIRH is working with partners in eight states to promote policies that will increase access to and protect the right to abortion. In six of those states, NIRH and the State Innovation Exchange (SiX) have teamed up to help advocates and lawmakers move affirmative abortion access policies over the next two years. Feminist Women’s Health Center and SPARK Reproductive Justice NOW! As a number of state legislatures and the Supreme Court work to diminish access to abortion, local leaders are prepared to defend, protect, and advance access for people in their communities. In several localities, NIRH is working with advocates and local policymakers to build support for abortion providers and to advance proactive policies to make abortion care more available and affordable. Cities are often key access points for reproductive health care, serving their own residents as well as people from surrounding suburban and rural communities; their efforts to ensure that compassionate and comprehensive reproductive health care is available can have an impact far beyond their borders. In 2017, NIRH launched the Local Reproductive Freedom Index as a snapshot and a roadmap to help cities achieve this vision. In 2019, NIRH is continuing to work with advocates across a number of cities to educate and build relationships with local policymakers as they work towards a common goal of creating a city that serves the reproductive and maternal health needs of all of their community, with a specific focus on marginalized populations. Many barriers exist for women trying to access preventative care, and more still to accessing high-quality preventative care. NIRH is partnering with CityMatCH on their Well Women, Well Communities Project over the next two years to work with cities and localities focusing on community-based initiatives (both upstream and downstream) that increase access to as well as utilization of well-women’s care. The cities below are working with their health departments, community organizations, and community members to address the barriers unique to their region, including systemic issues, and to foster authentic relationships with residents to tailor health care to their needs. All people deserve access to the full range of contraceptive options so they can select and use the method that is right for them. Unfortunately, a range of policy and systems-level barriers—including low insurance reimbursement rates, inflexible health care administration systems, and lack of provider training—often make long-acting reversible contraception (LARC), such as IUDs and implants, difficult to obtain. Using a framework that centers patient autonomy and choice, NIRH is partnering with organizations in seven states to remove these barriers to care. The State Infrastructure Project (SIP) is a long-term initiative to develop and advance a proactive abortion rights vision, engage a new and broad base of supporters, and reduce shame and stigma by publicly promoting the affirmative value of abortion in women’s lives. NIRH serves as a strategic partner to the project, supporting state cohorts, state coordinators, and individual organizations in Colorado, Florida, Georgia, New Mexico, North Carolina, Ohio, Pennsylvania, Texas, and Virginia to help advance the vision and strategy of SIP, support the aligned activities of participating partners, and coordinate the provision of a robust offering of technical assistance to SIP partners. 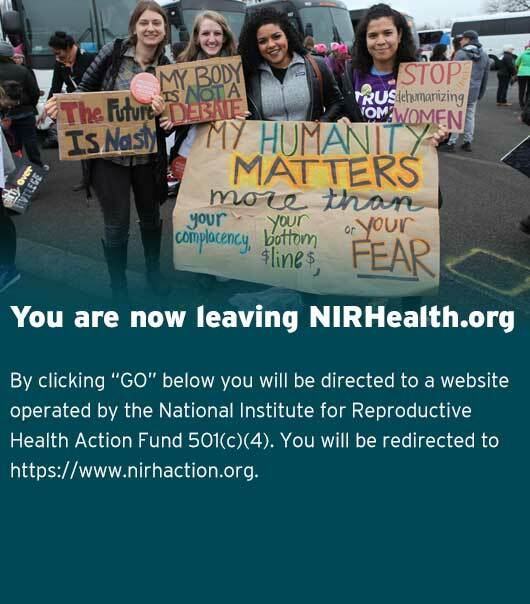 The NIRH Action Fund engages in message-driven campaigns to challenge conventional electoral wisdom, pilot new ideas, and mobilize voters to turn out to vote for candidates who are champions for reproductive freedom.